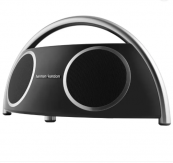 Flipkart India selling Harman Kardon Go Plus Play 60 W Portable Bluetooth Speaker (Black, Mono Channel) Rs. 12999 Lowest and best price online. Sale starts on 10th October.You can follow the below steps to buy this product at their deal price.Keep Visiting dealsheaven.in for more Best offers ,hot online deals, promo code, coupons and discount . How to buy Harman Kardon Go Plus Play 60 W Portable Bluetooth Speaker (Black, Mono Channel) ?